The Windows 10 operating system comes with a range of more or less useful applications. These are utilities and games like Candy Crush. Windows has its own utility to delete these applications. In the event of accidental deletion, the user must manually reinstall the program through the Windows Store. The other disadvantage of the native system is that it does not allow hidden software to be displayed. And yes, you may not know it there are hidden applications preinstalled on Windows 10. 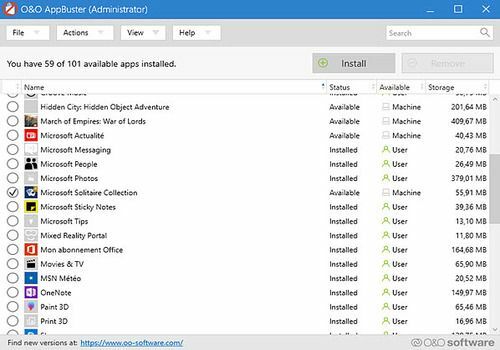 The AppBuster utility developed by O&O allows you to view these programs and delete them with a single click. It is also possible to reinstall these programs from the AppBuster interface. Etcher is a software that allows you to easily burn disc images to media such as SD cards or USB sticks. It is ideal if you want, for example, to install a new system on your computer. Kaspersky System Checker is a program that allows you to check the status of your Windows system in a few minutes. Firemin is a utility that directly affects the consumption of your machine's RAM by certain processes. AutoClose is a convenient Windows freeware that gives you the ability to close running programs on your system at a scheduled time. Connect your PS3 controller to your PC with this handy little software.